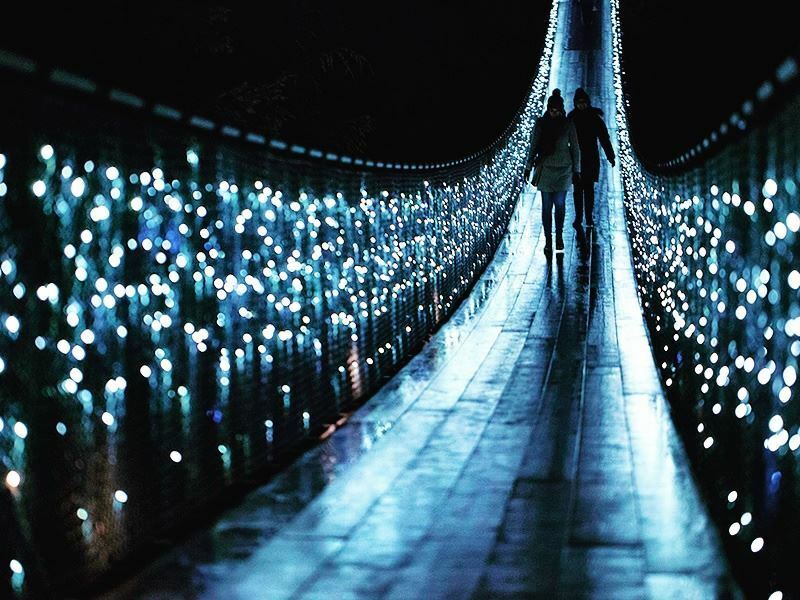 Drawing over 1 million visitors every year, the award-winning Capilano Suspension Bridge Park is a hugely popular North Vancouver attraction that offers a superb way to sample the unique natural environment, history and cultural heritage of the BC area through a diverse range of thrilling activities. 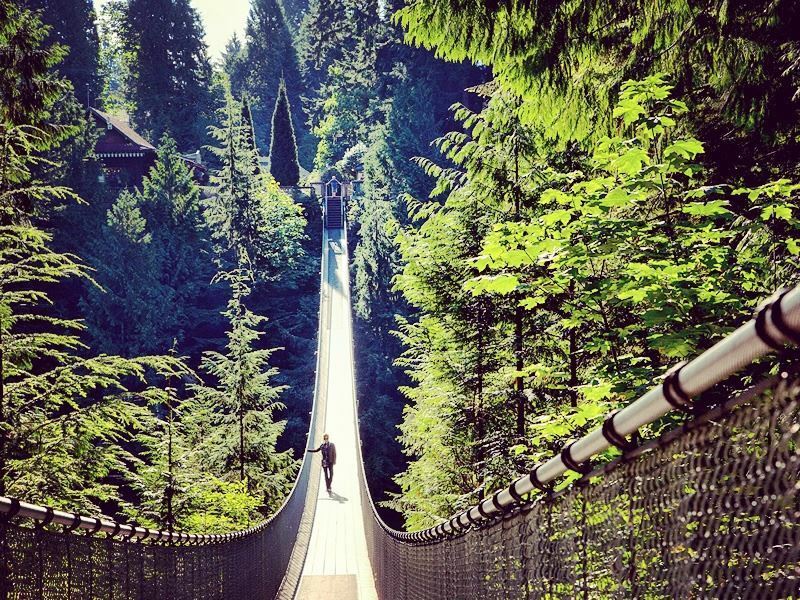 The 27-acre park centres around a spectacular suspension bridge, perched a dizzying 230 feet high above the Capilano River in a thriving West Coast rainforest that characterises the area. 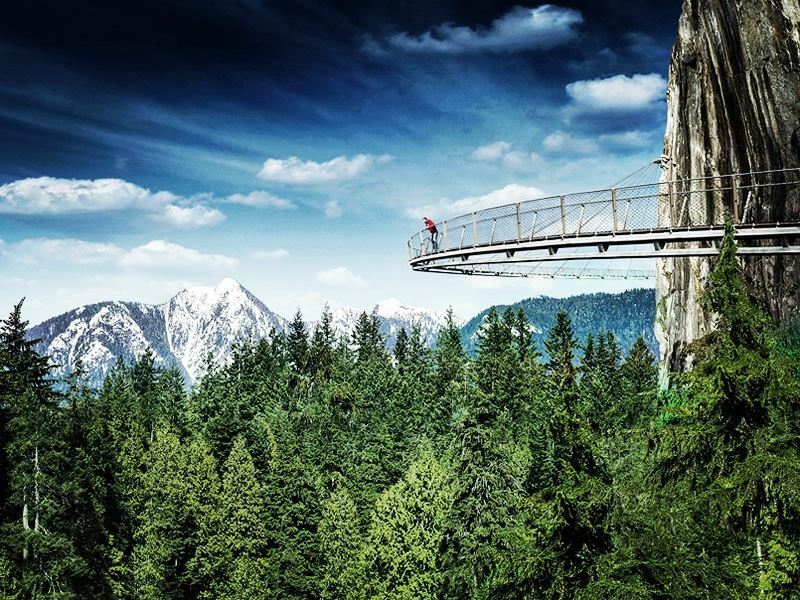 Over the years, a host of other memorable attractions have been added, including Treetops Adventure - an elevated boardwalk trail through the forest canopy – as well as Cliffwalk, a heart-pounding walkway built into the impressive Capilano canyon. Brave the dizzying heights, marvel at the panoramic views and immerse yourself amongst towering old-growth trees and the many wonders of this unique rainforest ecosystem. Add to this plenty of opportunity for sampling West Coast cuisine, shopping and culture, a host of exhilarating seasonal events, as well as countless fun activities for kids too, and you’ve got the perfect day trip on your hands. In short, Capilano offers a complete and authentic British Colombia experience that makes it one definitely not to be missed while visiting the Vancouver area. What’s more, the park can be easily accessed from Downtown. A free shuttle operates year-round from Canada Place, stopping at many of the city’s big hotels, or you can make your own way with just a short drive over the Lions Gate Bridge. The centrepiece of the park is the lengthy and rather wobbly suspension bridge that crosses the raging white waters of the Capilano River far below. 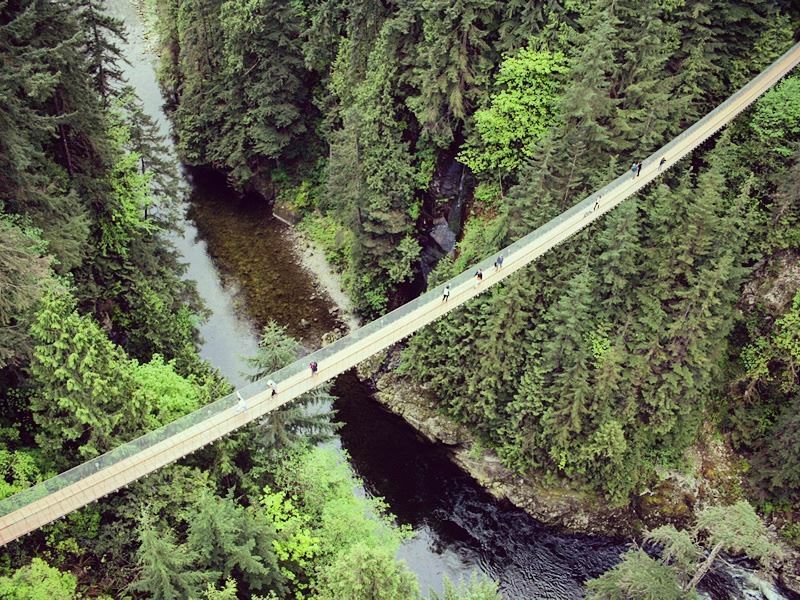 Stretching for 137 metres and built 70 metres above the Capilano River, it’s both one of the longest and highest suspension bridges in the world. Originally built in 1889 out of hemp ropes, it has long since been reconstructed using strong steel cables. From the bridge, visitors can enjoy outstanding scenic views across the surrounding old growth forest. Be warned that the attraction may become quite busy at peak times, so you may prefer to time your visit for later in the day when admission fees are also lower. As the bridge reaches the equivalent of around 30 storeys high, it’s generally not recommended for those without a head for heights! Another thrilling attraction at Capilano is Treetops Adventure, a suspended trail system that takes visitors on a fascinating journey through the area’s verdant temperate rainforest. 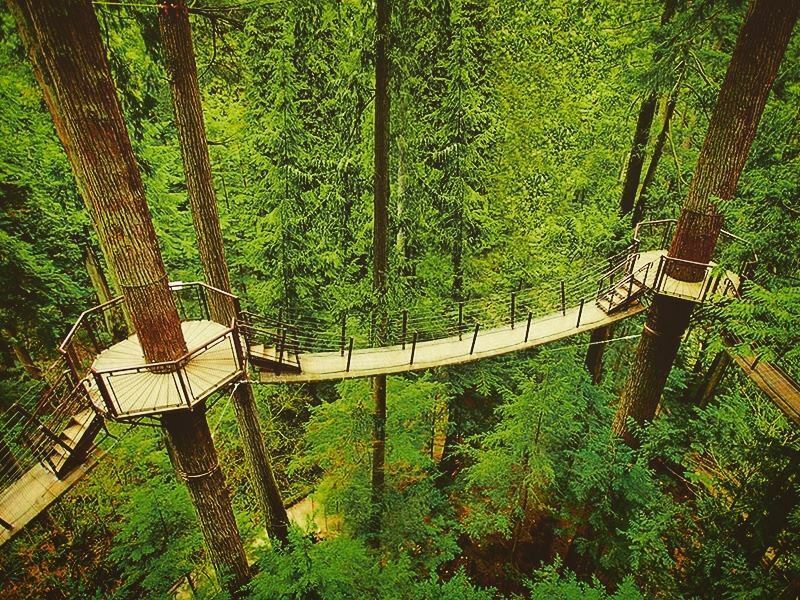 The walkway consists of seven footbridges suspended up to 110 feet above ground which wind between several impressive 250-year-old Douglas Fir trees. Built in 2004, it was one the first venues of its kind in North America, as well as boasting an innovative adjustable design that accommodates the continuous growth of the surrounding trees. The suspended bridges and observation decks provide incredible views and a unique perspective on the forest flora and fauna. Back on firm ground, there are plenty more trails and nature-based activities to dive into. Enjoy strolling through majestic thousand-year-old trees, past tranquil ponds and luscious vegetation, taking the time to learn more about your surrounds from the dozens of interpretative boards scattered throughout the area. Complimentary guided nature tours are offered every hour throughout the summer months and provide a deeper insight into the workings of the unique West Coast rainforest environment. The Birds of Raptors Ridge program, also held throughout the summer, enables you to get up close and personal with a range of different birds of prey. Meanwhile, there is also the popular Kids’ Rainforest Explorer Program that lets kids learn more about the rainforest as they scour for signs and collect research data along the nature trails. 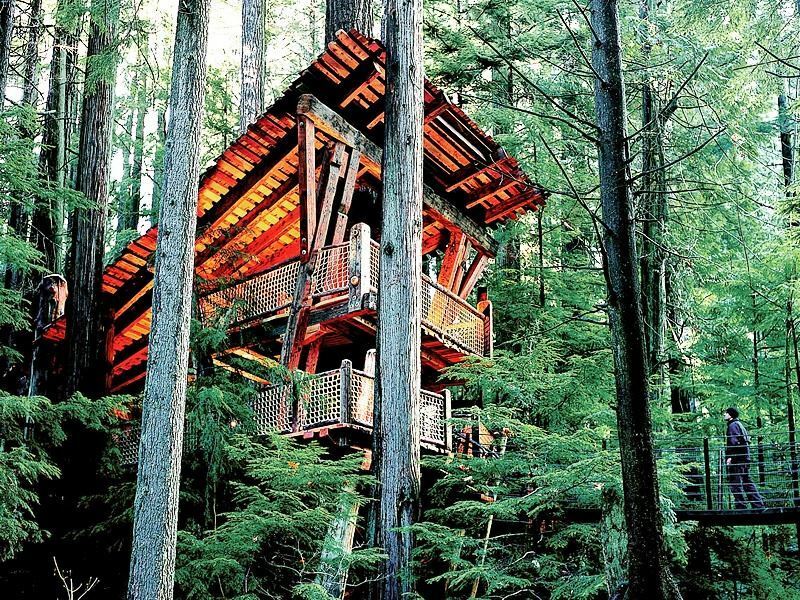 Children of all ages will also enjoy blowing of steam in the impressive multi-storey wooden treehouse found at the beginning of Treetops Adventure. The park’s most recent attraction, added in June 2011, is a jaw-dropping cliff side trail that leads visitors along the granite precipice of the Capilano canyon. A system of suspended walkways, bridges and observation platforms, firmly anchored into the rock face, provide a stunning bird’s eye perspective on the surrounding vegetation, waterfalls, wildlife and the raging river below. The walkways jut out from the cliff side at key points, providing a freeing feeling of immersion in the open sky. The Cliffwalk reaches heights of up to 90 metres, making it higher than the suspension bridge itself, and in some sections the walkway is also very narrow, so it’s not for the faint of heart! If you manage to avert your gaze from the scenic views, a series of interactive exhibits provide an interesting perspective on the area’s geology, climate and ecosystem. To witness the West Coast rainforest in a truly exclusive and magical way, don’t miss the annual Canyon Lights that run between the end of November and early January. During this period, you can experience all of the key attractions in a totally new way, as hundreds of thousands of glittering lights illuminate the towering trees, dizzying heights and natural splendours of the park. To further bolster your holiday spirit, you can go in search of snowy owls, get involved in festive baking, card-making and carol-singing, and check out the world’s tallest living Christmas tree. 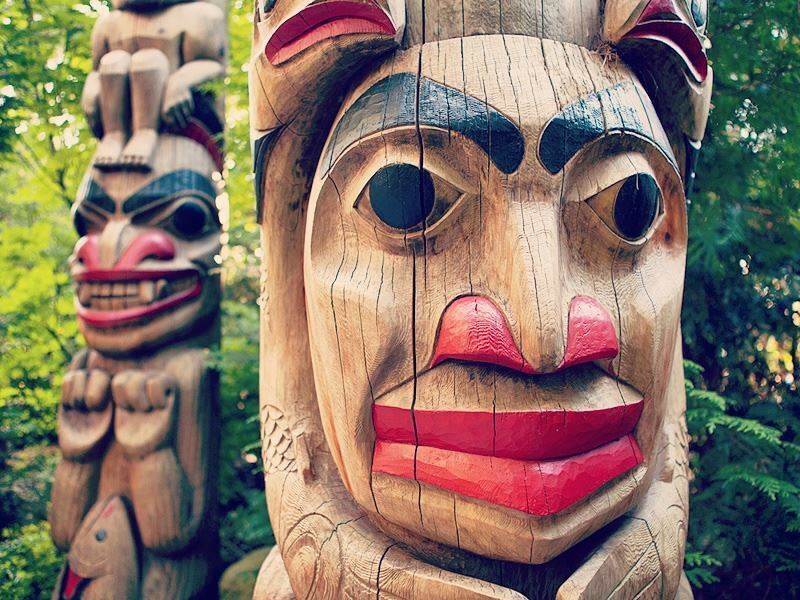 Capilano Suspension Bridge Park is also a great place to immerse yourself in the fascinating history, culture and legends of the local First Nations people. History tours, complete with costumed guides in the summer, provide an overview of the park’s evolution, the construction of the bridge, as well as the ongoing partnership with the First Nations people. The Story Centre provides an informative glimpse into the area’s long past, featuring photomurals, artefacts, antiques and informative flipbooks. At Kia’palano cultural centre, visitors can learn more about the heritage of the local indigenous people and their intimate connection with the natural world. The park is also home to a large collection of totem poles, including some local Coast Salish poles dating back to the early nineteenth century, as well as more recent examples which are carved on site in Kia’palano. With so much to see and do, you’re bound to work up a healthy appetite throughout the course of your visit. Thankfully, the park is home to a number of enticing dining options featuring a wide range of tasty West Coast fare. Packed full of locally-sourced ingredients and fresh flavours, these places are sure to satisfy your taste buds. The Capilano coffee company serves freshly roasted organic coffee, gourmet sandwiches and freshly baked goodies. Take the time to savour a drink and unwind on the attractive deck overlooking the Kia’palano Totem Pole Park. If you’re in search of something more substantial, Loggers’ Grill offers a mouth-watering selection of sustainably-reared meat and fish dishes including salmon burgers, sirloin beef burgers and Canadian spicy bratwurst sausage, along with poutine that comes highly recommended. For those with a sweet tooth, stop by the ice cream creamery which offers hand-crafted, locally-sourced ice-cream and plenty of innovative flavours such as honey lavender and strawberry lime. Finally, pick up a souvenir as a reminder of your visit at the historic Trading Post. This large hundred-year-old establishment sells a fantastic range of quality Canadian merchandise that satisfies all ages and tastes. Browse through the eclectic collection of outwear, clothing, accessories, leather goods, jewellery, First Nations Art and specialist food products. Perhaps most popular of all is the delicious Capilano fudge. The park claims to sell over 100,000 pounds of fudge every year and boasts dozens of memorable flavours to choose from.